I worked for publishing companies for many, many years either as a proofreader, a translator, or an editor. So my eyes have been used and abused for years… Once I started working with computers I noticed a decrease in vision and had to start using glasses. Luckily, I am married to an Ayurvedic practitioner and have the luxury of receiving an Ayurvedic therapy called Netra Basti, which is an absolute blessing for my eyes, whenever I feel like I need some healing in that area. I received one yesterday, after many days of staring at the computer non-stop, and I felt so good that I decided to share a little bit about it here. Netra Basti is, basically, a therapy for eye rejuvenation that can actually prevent many eye diseases and problems. Yet it is so profoundly healing that it goes beyond the eyes (perhaps because the eyes are so closely connected to the nervous system, the brain, and the third eye?). Every time I get one I feel so relaxed and clear and sleep so deeply that it is obvious that not only my eyes get rejuvenated in the process, but my mind receives its benefits as well! 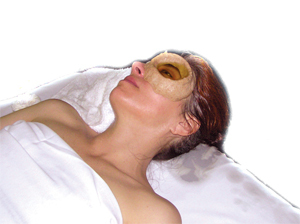 This Ayurvedic therapy consists in bathing each eye with warm ghee (clarified butter) or medicated oil for 15-20 minutes. It may seem weird to have your eyes bathed in oil or ghee, but the warm liquid feels really good and after a while you don’t even feel anything at all. I usually tear profusely from the eye that is not being bathed, which seems to be the way the eyes gets cleared and cleansed, and sometimes a lot of post-nasal mucus comes down, too, which helps to decongest the area. Since after the Netra Basti is over it is best to just relax and close the eyes, I usually have it done when I don’t have much to do afterwards, so I can stay home and close my eyes if I want to, which tends to be the case for me. I certainly don’t go fix my eyes on jewelry, or stare at the computer after a Netra Basti! I just wanted to briefly share this wonderful therapy that is so good for the eyes and also for the mind! It would be really great help for me if you can describe it in detail so that it will help to all of us who are working on computers for many hours…and willing to get the magic of this Netra Basti. Looking forward your kind reply. My (now ex-) husband used to do it on me, and I haven’t tried to do it on my own. It can be tricky because it is easy to spill the ghee and you are supposed to hold it for at least 20 minutes, but you can use an eye cup or goggles… If you can have it done by someone who knows, that would be best, so you can just relax and benefit more from it. Good luck! So you are not doing it now a days ? Well, that is the way it is with relationships, you know… They all eventually come to an end, and ours lasted 13 years. By the way it is so sad that after 13 years you got separated.. 🙁 Hope that you are happy in your life. 1) Are you taking the therapy daily ? 2) Do you blink eyes ( or constantly open ) during Netra Basti ? 3) How long does it take totally for both eyes ? 4) Are you taking it on both eyes at the same time or one by one ? 5) If one by one then do you put wet cotton on the eye while taking Netra Basti for other eye. You know why am I much interested in all this because at the age of 29 my retina of right eye got detached and it got operated successfully, but later on vision got blurred. And I know that Netra Basti is really a Magic.. But when… if you do it in Proper Way…. Note: You can discuss my case with him from whom you are taking therapy. Thanks for your good wishes, I’m doing well after the separation. I still receive the therapy, but not daily, only when I feel that I need it. You keep the eyes open during the therapy and usually have one eye done at a time, although I know this can vary from practitioner to practitioner. If it’s done on one eye, the other eye is lightly covered with a face towel or something like that, as it tends to get very sensitive and tear. For all your other questions, especially if you want to know whether the therapy is appropriate for your specific case, you should consult an Ayurvedic practitioner. Hope you find someone who can help you take care of your eyes! Sorry for the delayed reply due to tight schedule. Surely I will consult to the Ayurveda Practitioner.